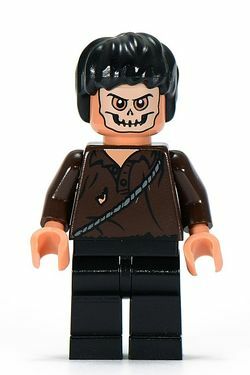 Cemetery Warrior is a Minifigure produced in 2009 for the Indiana Jones and the Kingdom of the Crystal Skull line. Cemetery warriors are assembled from a black coloured bushy hair, nougat-coloured head with special additional printing, dark reddish brown torsos with special additional printing, dark reddish brown coloured right and left arms, nougat coloured right and left hands, black coloured belt, and black coloured right and left legs. In LEGO Indiana Jones 2: The Adventure Continues they have a king, although they worship the Crystal Skull. The minifigure head piece is exclusive to this minifigure. Cemetery warriors are creatures that live in a cemetery, who ambush Indy and Mutt on a journey to find the Crystal Skull.